Eco cutey hipster Baby k* shoes were born out of designer Keiko Hirosue-Korolev’s desire to produce less waste in her shoemaking studio. She discovered that she could use fewer strips of raw materials by strategically cutting patterns for both her adult and baby shoes from the same squares of leather. “I guess next will be a collection of leather scrap jewelry,” says Keiko, half-joking. 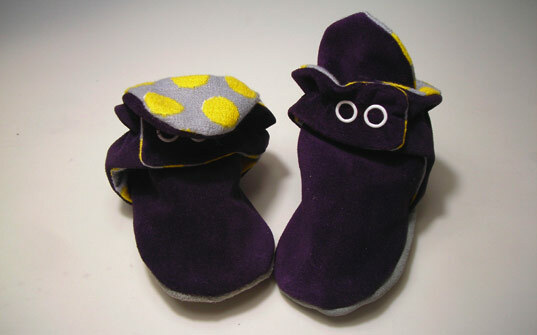 Keiko’s original design concept was to develop a line of ‘mommy and me’ shoes – slouchy boots for mom, booties for babes. Her vision aligned with practicality, resulting in her current line, baby k*. Keiko was inspired while touring shoemaking workshops in Italy on assignment for VPL. She witnessed firsthand the mastery of the local Italian artisans, and returned to her Brooklyn studio, determined to produce a quality line of handmade shoes for children. The current baby k* collection includes leather booties in a variety of unusual colors and textures. These are offset by funky inner linings that include floral, polka-dot and plaid cotton prints. 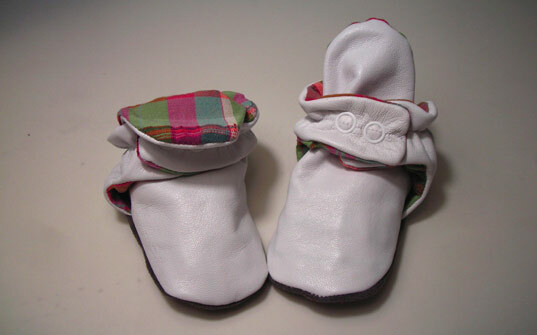 The soft soles are comprised of slip-resistant, brushed leather that is gentle on baby’s feet. They’re great for cruising around the apartment or toddling about town. Keiko promises that baby k* booties are just the beginning. She still plans on seeing through her original concept for a line of ‘mommy and me’ kicks; and she is beginning the process of fashioning a collection of eco-friendly booties and shoes for the winter ’09 season. Eco cutey hipster Baby k* shoes were born out of designer Keiko Hirosue-Korolev's desire to produce less waste in her shoemaking studio. She discovered that she could use fewer strips of raw materials by strategically cutting patterns for both her adult and baby shoes from the same squares of leather. "I guess next will be a collection of leather scrap jewelry," says Keiko, half-joking.